People seldom travel long distances without taking a series of photos or stops along the way. That’s why private travelers invest in a private charter bus to experience Las Vegas on their own time and schedule. Traveling by coach is far easier and more comfortable than by any other means of transport, as it provides travelers with a more intimate and friendly travel experience. Private bus transportation allows everyone to experience the spectacular views of Las Vegas from a different angle while you get to know your fellow travelers. Las Vegas Charter Bus Company will steer you through the labyrinth of Las Vegas, bringing the city’s magic to life before your eyes. It’s the journey there that really makes or breaks your trip. Why not ensure you’re chauffeured around the city in comfort and style? When planning a family reunion by private bus, what you put on your itinerary is up to you, whether you want to stop at nearby attractions or plan plenty of rest stops during your journey. By leaving the driving up to us, your family will avoid wasted time planning routes and navigating traffic. We’ll even take care of the parking hassles, so you can focus on the trip at hand. That way your special reunion will be fast-tracked with a private shuttle at your service, saving sometimes up to several hours by maneuvering around bumper to bumper traffic and limited parking. A private charter bus will give you more features on every trip at no extra cost, so you can be bussed to quality hotels in desirable locations with ease. You’ll get to enjoy more sightseeing while receiving a top-of-the-line personalized travel experience with a professional driver. We ensure your family's comfort when traveling with Las Vegas Charter Bus Company. Our luxury coaches have been configured with extra space, so large reunion groups can relax in style while enjoying more than twice as much legroom than on a standard traveling coach. Exclusive features on your premium coach will provide you with extended luggage bays, reclining seats, and climate-controlled interiors to help you stay comfortable during your travels. You can even recline while watching a movie or playing a DVD on one of our portable TVs without crushing the person behind you. Our spread-out seating arrangement creates more space for personal belongings in the luggage bays above and below your seats. Each guest can enjoy extra window space to look out at the dazzling lights and dessert scapes of Las Vegas. In a private bus, you’ll spend less time waiting to get into private events, looking for parking spaces, or finding your way to venue locations and more time bonding with your special guests along the way. Travelers in a hurry can check into their hotels faster with plenty of room to take their luggage with them along the ride. Important clientele or association members can enjoy a more personalized service, including their choice of seat on your shuttle. On a private bus, panoramic windows guarantee that everyone gets to enjoy the great views of Las Vegas while traveling head and shoulders above city traffic. There are also on-board restrooms on all full-sized traveling coaches to ensure your guests’ comfort and convenience, no matter the distance of the trip. A private ride allows you to choose how you spend your time when prioritizing important events. Choose the size of your vehicle based on the number of guests, added features, and trip distance. Our network of buses will provide you with an exciting and varied private travel experience. Whether you’re booking travel for an important event scheduled at the Las Vegas Metro Chamber of Commerce or you’re simply planning private parties with family and friends, you’ll enjoy your journey every step of the way. 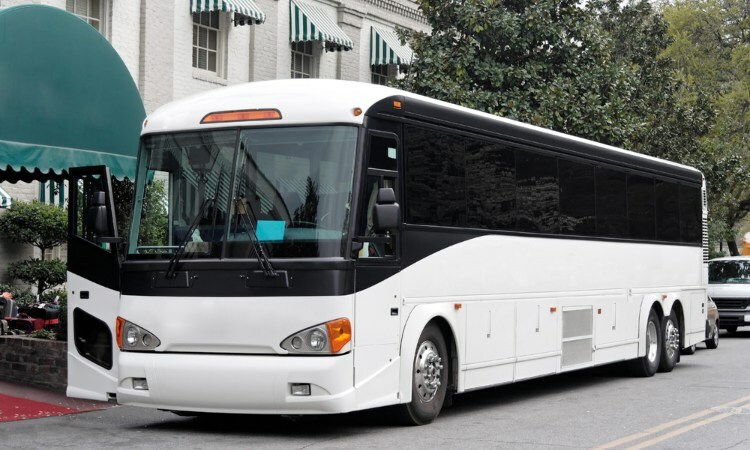 With space for up to 56 guests in a premium MCI coach bus, you can shuttle all of your event attendees together instead of taking multiple caravans to the event in a standard 10-15 passenger coach. If you’re traveling for smaller private conferences, you can invest in a 25-passenger minibus for a cozier ride to short-distance getaways. At Las Vegas Charter Bus Company, planning the perfect travel is our specialty. We’ll handle the parking and traffic hassles, so you can carefully balance your itineraries on your schedule. Our dedicated team will handle the rest to give you plenty of free time to relax and immerse yourself in the location. Your personal driver will grant you more time to plan fun group activities and personal time to explore popular nearby cities. Book with one of our travel specialists at 702-780-0886 for your transportation solution to private travel in and around the Las Vegas area. We'll make it our mission to pair your private group with a custom ride that suits the number of passengers and trip type to streamline important members to faraway destinations.